Cuban author Teresa Dovalpage has published three novels, one in English, A Girl Like Che Guevara (Soho Press 2004) and two in Spanish, Posesas de la Habana (Haunted Ladies of Havana, PurePlay Press, 2004) and Muerte de un murciano en La Habana (Death of a Murcian in Havana, Anagrama, 2006), which was runner-up for the Herralde Award in Spain. Her collection of short stories, Por culpa de Candela, was recently released by Floricanto Press in 2008. Her short novel, El difunto Fidel (The Late Fidel) just won the Rincon de la Victoria Award in Spain. Dovalpage currently lives in Taos, NM. Visit her at www.dovalpage.com. Thanks for this interview Teresa. It’s a pleasure having you here. Tell us a little about your childhood? Were you an avid reader? I grew up in Havana, in a house full of books. And I was definitely a bookworm, or, as my mother liked to call me, una ratona de biblioteca —a library mouse. I could always be found with a book in my hand or scribbling something. I was too shy to play with other kids and that made me long for the company of those quiet, faithful paper friends that don’t talk back or tease. When I was a teenager I wrote my first short story. Quoting my mom again, it was horrendous. It had something to do with a deadly plague, and not too cheerful… But I didn’t get discouraged. I bought an ancient Underwood typewriter (it was during the 80’s, in Cuba, and computers were then considered as science fiction devices) and continued to write away. What was your inspiration for A Girl like Che Guevara? My American friends, who kept asking me how life in Cuba was. I started writing a series of vignettes about Santeria, life in the school-in-the-fields (a program in which high-school students used to spend a couple of months working on the tobacco fields) and other Cubanese stuff. And it turned out to be a full-length novel after all! On average, how long does it take you to write a novel? The first decent draft (not the “vomit draft”, eh, but a well-polished one) may take several months, from six to eight. It seldom takes longer because I start getting bored with the plot and the characters. But I have learned to put it on the back burner for a while and return to it before sending the ms. out. I always find a lot of things to change in that phase so I start rewriting it… Then, all together, maybe a whole year. What is your writing ritual? Are you a disciplined writer? I write for several hours every day when I have the opportunity. I work part-time as a Spanish professor at the University of New Mexico and that allows me to devote time to writing. Though I wouldn’t use the word “disciplined” to describe me in this context. I need discipline to go to the gym, to study a new language and even to get up early. But I love writing so I keep doing it whenever I have a chance. Did you have a smooth path to publishing? It wasn’t too rough. I sold my first novels by myself and now I have two very good agents who take care of that part of the business. But still, it does take time, energy and commitment. And discipline (here I would definitely use the word) to send the manuscripts out and not to get discouraged with rejections. Do you have any favorite authors? What type of books do you read for entertainment? Yes! In English I love Ann Tyler. I have read all her books several times. One of my favorites is The Accidental Tourist. I also admire Lorraine Lopez, who just published The Gifted Gabaldon Sisters and who is also a creative writing professor at Vanderbilt University. I like the Spanish classics of the nineteenth century (Benito Perez Galdos, Leopoldo Alas, Armando Palacio Valdes). In fact, I brought all the way from Cuba a ragged copy of La Regenta. I supposed that I could find the book here but just in case…I am also a big fan of Daina Chaviano and Pedro Juan Gutierrez. My play Hasta que el mortgage nos separe (Until Mortgage Do Us Part) will be staged on Chicago by Aguijon Theater in May and June and my short novel El difunto Fidel (The late Fidel) will be published by Editorial Renacimiento in Spain so I will be promoting them this summer. 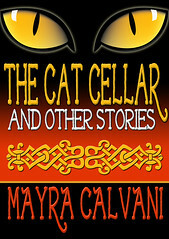 I am also working on another collection of short stories in English. Thanks, Teresa! And good luck with your work! 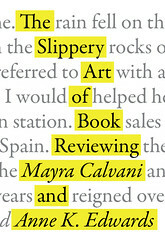 (Kingsport, TN – May 15, 2009) — We are pleased to announce The Slippery Art of Book Reviewing, written by Mayra Calvani and Anne K. Edwards, is a 2009 Next Generation Book Award Finalist. PRLog (Press Release) – May 15, 2009 – The Slippery Art of Book Reviewing was written not only with the aspiring reviewer in mind, but for the established reviewer who needs a bit of refreshing and also for anybody-be they author, publisher, reader, bookseller, librarian or publicist-who wants to become more informed about the value, purpose and effectiveness of reviews. The Slippery Art of Book Reviewing is a one-of-a-kind book written to compile as much information on book reviewing as possible in one place for the convenience of new and experienced book reviewers. Written to serve as a guide, it is also an amalgam of resources for those aspiring reviewers who wish to have their reviews published in print and online. A Foreword Magazine’s Best Book of the Year Finalist, EPPIE Finalist, and US Book News Finalist, The Slippery Art of Book Reviewing is currently required reading at Loyola College, and Kent and Claremont Universities. The Slippery Art of Book Reviewing is the product of Mayra Calvani and Anne K. Edwards’ tireless research on the subject and written in an informal language to make it easy to understand for anyone aspiring to become a book reviewer. It will be updated periodically to include new information on reviewing as it becomes available. This book is available through all book sellers online and may be ordered from brick and mortar bookstores as well. Sample of content, blurb, reviews and authors’ bios can be found at http://slipperybookreview.wordpress.com. Not being a psychologist or a doctor, I’m reviewing this book from the point of view of a person who is familiar with ADD and ADHD only from personal experience and from reading extensively on the subject. When you hear the term ADD, hyperactive, badly behaved children who do poorly at school come to mind, but this condition doesn’t only affect children. Gina Pera’s book, Is It You, Me, or Your Adult A.D.D.? takes a look at an often ignored aspect of ADD, that of adult ADD. The book is divided into three parts. Part I mainly deals with discovering the condition in your partner and the roller coaster ride that it often is; the signs; the twists and the turns. Part II takes a close look at the disorder itself, breaking down its elements; and its management. In Part III, the author shares four successful strategies. Don’t be fooled by the fact that the book only has three parts, as each one is scrupulously detailed and offers an amalgam of information. With its 370 pages, the book is quite hefty. I don’t want to list all the topics included in the book, but suffice to say that it covers ADHD in all its forms, from what it is, to its effects, to how to treat it, to the misconceptions, to its sometimes erroneous perception by doctors and educators, to the various treatments and medications available. Pera also looks at the possible causes and at the possibility of it being hereditary. Pera uses graphics, tables, and a full bibliography to support the information offered in the book. It is also well structured and clearly written in a straight forward, engaging style. Some people joke about it; others take it lightly; yet others take it seriously. One thing’s for sure: ADHD affects many people and their families, and the more we become educated on the subject, the better. From what I have read and heard, it’s amazing the ignorance of most people on the subject. If you have a partner who suffers from ADD, this book is definitely a must read to help put things in perspective. 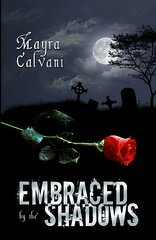 Visit the author’s blogs at http://adhdrollercoaster.org and http://adhdpartner.org.